Living incomes of coffee farmers depend on their origin. 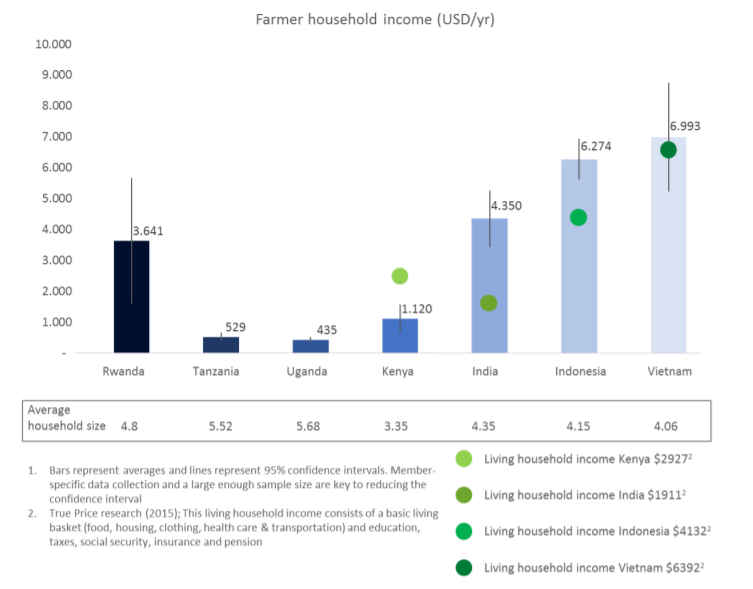 As shown in the diagram above, in Vietnam, India and Indonesia the average household income lies above the living income, while in Kenya the living income is more than twice as high as the average household. Living incomes could not be calculated for Rwanda, Tanzania, and Uganda. For more information, see the full report or executive summary. Description: True Price developed a rigorous and scalable methodology to measure the farmer household income of coffee producers across 7 countries. Results allowed us to compare wages and incomes to regional benchmarks. The analysis included insights in the distribution of farmer household income, the profitability of coffee and the value added.